The origins of the violin were likely rooted in India or the Far East. In fact, musical instruments that are played with a bow appear in centuries-old paintings and pottery from many different civilizations. But there is no doubt that the violin we recognize today originated in mid-1500 Cremona, Italy, more specifically from the hand of Andrea Amati. Andrea’s grandson, Nicola Amati, enlarged the pattern and refined the violin, passing his knowledge to Stradivari and Guarneri. In short order, other famous makers emerged in Cremona, Carlo Bergonzi being the most prominent. Cremona had quickly become famous throughout Europe and elsewhere. Indeed, this Golden Age of violin making produced the greatest violins the world has ever known. Today, Cremona is a bustling and prestigious violin making center once again, having gone back to the roots of violin making as practiced by the great Cremonese masters of the golden age. With the guild system largely bypassing Cremona, the traditional way of violin making has enjoyed a renaissance in Cremona. The Cremona International Violin Making School opened in 1938, and has produced great makers ever since. As in the earlier bygone era, Cremona has had a profound influence on the art of modern making, with similar schools opening in Parma, Milan, and other centers. Focusing strictly on individual hand-craft techniques, from wood selection to varnish work, and eschewing production processes, violin making is alive and well in Italy, with some of the greatest violin makers in the world working there today. 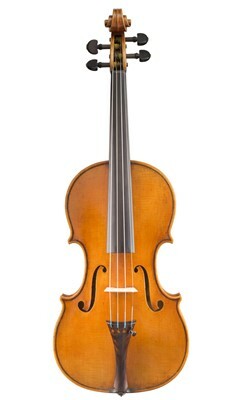 A modern violin from the hands of a well-known Italian maker is held in the highest esteem by today’s players and collectors, regularly fetching the highest prices in the market for new violins. Thank you for reading! If you are interested in learning more about the various sting instrument making traditions of Europe, click the link below. For weekly or monthly informational blogs like this one direct to your email, as well as product reviews, string instrument news, and fun contests, and more, put your email in the "subscribe" box on this page! You can also find SHAR on facebook, instagram, and twitter!